The last Krispy Kreme donut I had was last summer when my wife carried one home in her suitcase in a small metal box. MMmmm! I have not sworn off of them. The reason I have not had one is that there just aren’t any Krispy Kreme (or Dunkin’ Donuts*) in these parts. 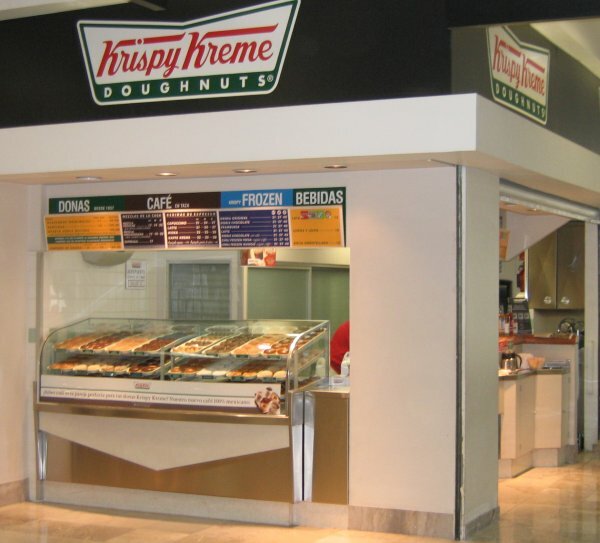 On my way through the Mexico City airport last week I learned that there was now a KK there. But you had to leave the secure area and go back down into the main entrance. I decided to wait until I was on my way back home to venture down there. I had a longer layover and it was better timing for taking some home to the family. Having spent way too many hours in the airport, I knew right where the KK should be. I was so giddy when I saw it yesterday morning that I had to pause and snap the photo. I bought a couple puff balls of bliss and a cup of coffee. Before I left the airport I was carrying 2 dozen donuts in a plastic bag. What was left over after breakfast this morning got shared with some friends over coffee. Just three more left and they will be gone tomorrow morning. MMmmm! They would definitely be petrified if they took as long to get here as my microphones have taken. I am still holding out hope that they are coming. They were ordered back at the end of January. Just call me an optimist. We will have to get together and down a couple of donuts when I am in town next. Then we can head out for a run. Can you pencil me in for late August of 2008?